DiveRace Class E is a modern Liveaboard launched in 2015. She was designed according to international standards of safety and quality. 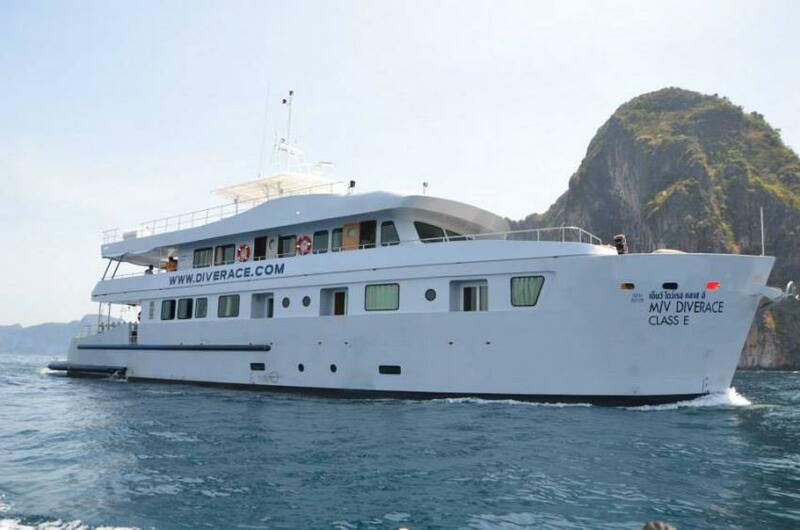 DiveRace Class E (Indonesia) can offer accommodation in twin and quad cabins. Their total amount is 10 and 28 passengers can be welcome on board. All rooms have a personal shower and air conditioning, also there are charging points in every cabin. Boats salon is big and light with comfortable sofas. Here passengers will find lots of entertainment for themselves: games, books, you can watch a TV or DVD. It is a perfect place to spend time in between dives. Also, you can rest on the sun deck of DiveRace E. It is spacious, equipped with sun loungers. Evenings are great on the sun deck. Enjoy watching as the sun comes down. Dive deck of DiveRace Class E Liveaboard equipped with all necessary to make your diving comfortable. There are storage boxes for the gear, hanging area for the suits. Boart is rebreather friendly and has availability of using nitrox. Safety is always an important issue for DiveRace crew. There is necessary equipment to provide safety onboard first aid kit, an emergency raft, and life vests, team members are trained in first aid. DiveRace Class E itineraries include diving on Anambas Island, Igara Wreck, Banzai Wreck. Anambas Island known for a variety of corals. They are healthy nd colorful and also a home for numerous of marine creatures. Nudibranchs, barracudas, blue spotted stingrays and much more can be spotted here. Igara wreck included in the same trip as Anambas Islands. This is a huge 40 m meters long sunken ship. Wreck attract much fish, sometimes even nurse sharks can be seen here. Banzai Wreck is another destination that can be visited during the safari on DiveRace Class E. This ship is home now for thousands of fish. Indonesia is an all year round destination. Current can sometimes cause drought conditions for diving and bad visibility.